Formerly Medical Fees in the United States. Health insurance companies will never tell you that your fees are too low. Now you can find out for yourself. Fee data at the 50th, 75th and 90th percentiles, plus medicare fees and relative values (RVUs). Also includes geographic adjustment factors. 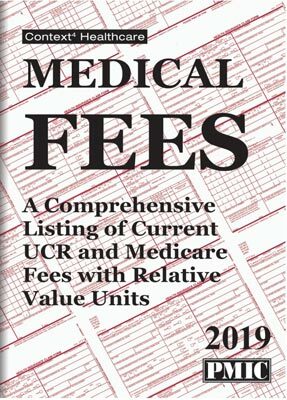 A comprehensive listing of current UCR and Medicare fees with relative value units. Medical Fees 2019 includes everything you need to review your fees, set fees for new services, challenge low payments from third party payers, and evaluate managed care contracts. The fees are based on an analysis of over 1 billion health insurance claims submitted to third party payers. Health insurance companies will never tell you your fees are too low. Now you can find out for yourself!